So here we are about to start the SEVENTH year of this blog! Hard to believe it and boy, does time fly. Below I’ve compiled my list of the best and worst of 2017. As is typically the case, by the time it came to make this list things became a bit of a jumble and I decided to choose the movies that I had the strongest reaction to when I saw them. I don’t revisit movies often but anything in the Top 5 are films that I’d add to my collection. As always, I’ve appreciated your feedback, your patronage, and your general presence in my blog. Even if you read this everyday but have never commented or made contact I can still tell you’ve been here and that means a lot. My readership and subscriptions leveled off a bit in early 2017 but picked up nicely in the second half of the yearand it’s all thanks to your word of mouth, likes, and shares. If you haven’t already, make sure to follow this blog, follow me on Twitter (@joemnmovieman), and like my Facebook page so you can help me continue spreading the news about The MN Movie Man. 5. The Big Sick – while it didn’t exactly become ‘the little indie that could’ as expected, The Big Sick stuck around for a long time in theaters based on positive word of mouth alone and in Hollywood that kind of buzz is worth more than gold. Writer/star Kumail Nanjiani’s true story on how he met his future wife and, through a stressful series of events, his future in-laws is a wonderfully comic look at love and family. In our current political climate, it’s also a deft look at cultural stereotypes within the family structure of immigrants and how the second generations are cutting their own path toward the Great American Dream. 4. Blade Runner 2049 – A forward-thinking sequel to the futuristic 1982 cult classic, Blade Runner 2049 should have done much better at the box office and I’m still puzzled as to why this one fizzled so fast. Big, bold, and beautiful, I saw this one twice in theaters and could have gone a few more times had the fall not gotten so cramped. Director Denis Villeneuve (Prisoners, Enemy, Sicario), continues to be a force to be reckoned with and he gathered the best and brightest in front of and behind the camera to create a spectacular sci-fi epic. Special mention to Dutch breakout Sylvia Hoeks who gets my vote for Best Villain of 2017. 3. Phantom Thread – this one isn’t out in many theaters yet so my full review is pending but this late-breaking film quickly jumped to my Best of the Year list. I’ve been completely off the Paul Thomas Anderson bandwagon for the last few films (Inherent Vice was on my worst of list in 2015) but I’m applying for membership to his fan club after this strikingly gorgeous beautiful film he’s delivered. It’s rich on multiple levels, not only in the ornate fashions on display but in the deeply emotional performances from star Daniel Day-Lewis (Lincoln) and two strong female supporting characters Vicky Krieps and Lesley Manville (Maleficent). This one really knocked me over and blew my socks off…really sublime. 2. The Lost City of Z – Released in April 2017, you’d be forgiven if you’ve missed out on The Lost City of Z. It’s so very, very good that it’s more than a minor heartbreak that it didn’t get the proper attention when it arrived in theaters. I think the marketing from Amazon Studios really failed this film which should have been delayed to later in the fall for a more prestige release date. Based on the bestselling novel, The Lost City of Z is a haunting tale of adventure and obsession that has stuck with me ever since I saw it. The performances are stellar (who knew Pacific Rim’s Charlie Hunnam had it in him or that The Rover’s Robert Pattinson could be so compelling?) and director James Gray’s paces the film so well that the lengthy running time will surely fly by. Seek this one out at all costs – you’re missing something special! 1. Get Out – Comedian Jordan Peele’s directorial debut captured lightning in a bottle and has kept that energy going ever since its release almost a year ago. On its way to Oscar nominations for Best Picture and Best Screenplay (and perhaps one for Best Director? ), Get Out is hands down the most original and entertaining film I saw throughout 2017. I missed the critics screening for this one so found myself paying for a mid-week showing several weeks after it came out. The reactions of the packed audience were but a ¼ of the fun to be had, I’ve watched it again at home and it works just as well. Peele masterfully commands our attention in this Stepford Wives-esque tale of a white girl bringing her black boyfriend home to meet her parents. Nothing is what it seems on their posh estate and the deeper we dive down Peele’s rabbit hole the more intriguing the picture becomes. Scary, funny, on message, and supremely timely, Get Out is the kind of authentic filmmaking that’s becoming a rarity in Hollywood. Just plain perfect. 5. Goodbye Christopher Robin – I love Winnie-the-Pooh. I did not love Goodbye Christopher Robin, a syrupy biopic on the man who created the lovable bear that lived in the Hundred-Acre Wood. According to the filmmakers, A.A. Milne and his wife (a woefully terrible Margot Robie, Suicide Squad) were largely absentee parents that wound up exploiting their only child’s imagination for his stuffed animals for financial gain. A late breaking and purely cinematic change of heart in Milne is the stuff of trite redemption stories but by the time it arrives the damage has extended too far into our consciousness. 4. mother! – Oh, how I was looking forward to this one. This is one movie that had all the cards stacked in its favor. An air of mystery, a celebrated director, a bankable movie star lead, and a supporting cast of solid actors that each have headlined their own film. How did this one go so wrong? mother! winds up on this list for being intensely unlikable at its best and practically unwatchable at its worst (which is most of the time). An intriguing first 45 minutes (featuring the wonderfully feline Michelle Pfeiffer, Grease 2) gives way to utter insanity and culminates with a series of stomach churning developments. Movies should always have an element of challenge to them but this one pushes the wrong buttons. 3. 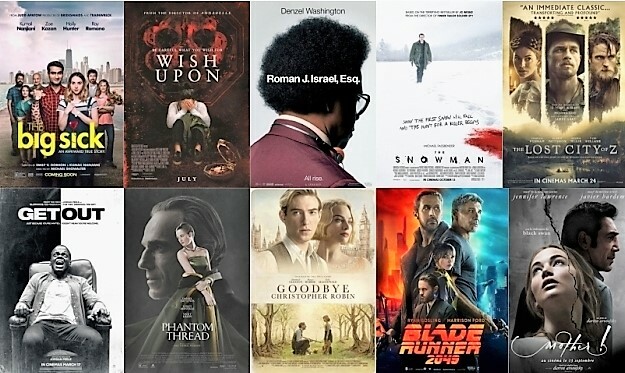 Roman J. Israel, Esq – Last year Denzel Washington had two movies that debuted to different receptions (Fences and The Magnificent Seven). In 2017, Washington appeared in but one film, this severely misguided legal drama from writer/director Dan Gilroy (who was at the helm for the superb Nightcrawler in 2014) and the problems it has are too numerous to count. It’s hackneyed plea for social justice reform reeks of half-baked rewrites and last-minute fixes and the supporting characters are but mere stereotypes. Even the reliable Washington is bizarrely off his game here, the Oscar buzz around his performances is mystifying. 2. Wish Upon – even thinking about this one again makes me mad. Best to just tell you it’s horrible and barely coherent and leave it there. 1. The Snowman – unquestionably the poorest film released in 2017 and maybe one of the worst films of the last decade, The Snowman is uniquely terrible. It’s a film that’s awful from almost the first frame and never even makes the effort to better itself. That it’s filled with A-list stars and based off an international bestseller is bad enough, but most of the reasons it’s the worst of the worst is old fashioned bad filmmaking. An embarrassingly heinous film and one that I’m sure will quickly be jettisoned from the resumes of everyone involved. Let this one melt and never be heard from again. Most Misunderstood: Valerian and the City of a Thousand Planets – Make no mistake about it, this movie is absolutely bonkers and will likely only appeal to the very (very) open-minded. I’ve found myself in opposition with critics and spoon-fed audiences that have trouble with these outlandish sci-fi yarns (see my lone-wolf praise for John Carter) but I can also understand where their fears come from. I wasn’t prepared to love this one but it was so gaga in the visuals department and so unpretentious in its goal to jolt your senses that I had to give it some well-deserved major kudos. Joe’s Humble Pie Award of 2017 (movies that turned out differently than I expected going in): Darkest Hour – True story, but I was really dreading seeing this slice of life biography on Winston Churchill. Knowing that it covered the same period that was depicted so masterfully in Dunkirk, I just couldn’t muster any kind of excitement for it even after hearing that Gary Oldman’s performance as Churchill was an Oscar shoo-in. While it isn’t a perfect film due to some pacing issues, director Joe Wright (Anna Karenina) and Oldman gave audiences a rarity: edge-of-your-seat entertainment with a story anyone that has ever taken a history class was already well-aware of. Review: We should all be thanking Mission: Impossible 2. It may be hard to fathom now, but had his filming as the villain in that sorry sequel not stretched beyond its original shooting schedule, Doughray Scott and not Hugh Jackman would have been the one that wound up playing Logan/Wolverine in nine films. Well, actually, I’m not sure Scott had the charisma necessary to have lasted as long as Jackman has in the role. Though he’s ably stretched beyond the superhero universe, Jackman will always be favorably associated with this character/franchise and rightfully so. Showing a willingness to be a team player (popping up in a cameo during X:Men – First Class) or going his own way in two stand-alone Wolverine pictures, Jackman has seen this role through to the end. We may see Wolverine again in some form but if Logan is truly the finale Jackman has promised, he’s gone out in a burning blaze of glory. It’s not worth going back and trying to connect the dots between the X-Men movies when thinking about Logan. Taking place in the near future shortly after a catastrophic event that dramatically decreased the number of mutants roaming the globe, we meet a weary Logan living under the radar and showing his age. Moonlighting as a limo driver for extra cash and with his earth-saving days seemingly behind him, he acts as a guardian to Professor X (Patrick Stewart, Green Room), now suffering in an advanced state of dementia. Crossing paths not only with a silent but deadly pre-teen mutant (Dafne Keen) but the bounty hunter (Boyd Holbrook, Gone Girl) intent on tracking her down, the aged man with adamantium claws that spring from his knuckles doesn’t want to be anywhere near the action. Resistance is futile, though, and Logan begrudgingly becomes a foster parent of sorts to the girl, committing to delivering her to a protected area in the upper Midwest while keeping Professor X close by. The trip is rocky with many unexpected detours, all leading to a surprisingly emotional climax that feels justly earned. With all the “last time as Wolverine” talk surrounding Logan, I’ll let you find out for yourself where our hero is when the credits roll but don’t be surprised if Jackman, reteaming with The Wolverine director James Mangold, has a few tricks up his sleeve as he closes this chapter. The previous two solo Wolverine films have been a mixed bag. The first was an outright miss, stumbling out of the gates and pretty much nixing several planned X-Men spin-offs at the same time. 2013’s The Wolverine was a much better film than most gave it credit for but in the end the third time really is the charm because Logan represents the best of what all involved have to offer. It was a good move on the part of 20th Century Fox, emboldened by the smash success of Deadpool, in okaying Mangold and his screenwriters to make Logan a hard R, a rating it earns within the first five minutes thanks to a gory bit of violence and a barrage of colorful language. I’ll admit to enjoying hearing Stewart swear like a sailor and while I generally favor the less is more approach, free from ratings restraints it seems like everyone and everything is much looser and less cautious. The violence is exceedingly vicious and no flesh, blood vessel, bones, or skulls are spared. And it never feels forced, just that the studio finally allowed the audience to see this world as it was always meant to be. Admittedly, the X-Men aren’t quite in my wheelhouse and it’s taken me a while to come around to their place in the superhero universe. I feel they’ve improved as they’ve gone along, feeling less comic book-y and more wholly formed with each passing entry (I know you all hated X-Men: Apocalypse but I dug it just fine). While Logan isn’t directly tied to those previous films (like Apocalypse was to X-Men: Days of Future Past), it’s clear they are all operating in the same timeline and for that Logan feels like a step in the right direction. Coming so far from just chomping on a cigar and trimming his mutant mutton chops, Jackman knows this character inside and out. He takes the opportunity (and lengthy running time) to bring out every nuance he can, not letting Logan be changed from a grumpy old man overnight. He’s matched well by Stewart, doing his best acting than in any previous X-Men film. Crippled by his disintegrating brain, his grizzled appearance is a far cry from the wheelchair bound gleaming cue ball in a designer suit we have come to enjoy. Holbrook manages to make his villain nicely vile without alienating the audience in the process but the real find here is Keen who is able to handle some pretty heavy material and handily go claw-to-claw with the leading man. 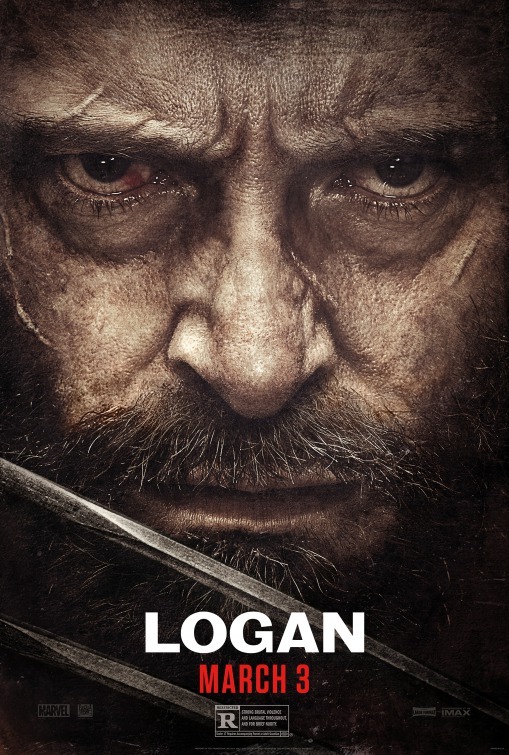 Featuring several super charged action sequences and just gorgeously filmed in general, if there’s one thing I could ding Logan for it would be a nagging sense of familiarity to its tale of redemption. While it has its fair share of original moves, you’ll likely be one step ahead of its protagonists on multiple occasions. No matter, the movie hums along so nicely that even at nearly 2 ½ hours the time will fly by. For my money, Logan is the best of Jackman’s outings as Wolverine and I’m glad it doesn’t wind up feeling like a tired final act. This is what true character completion looks like and I applaud not only the entertainment value of the movie but the cast and crew that were allowed by their studio the freedom to give a proper send-off. Highly recommended and likely worth a second viewing as well. 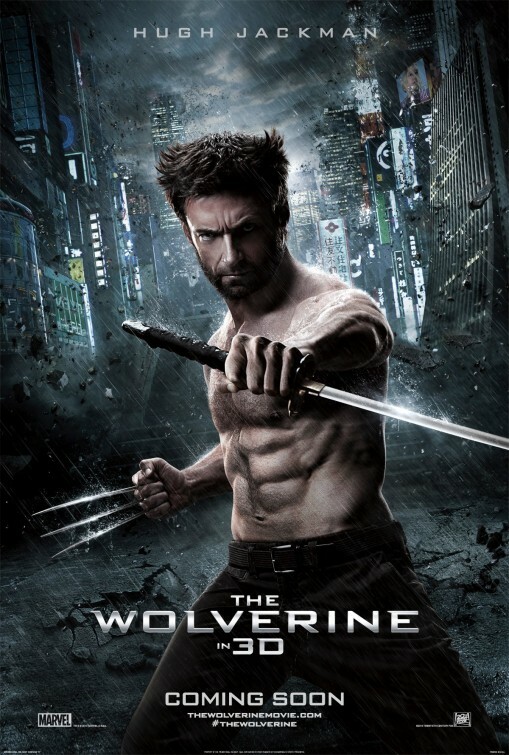 Synopsis: Summoned to Japan by an old acquaintance, Wolverine becomes embroiled in a conflict that forces him to confront his own demons. Review: It’s hard to imagine it now but audiences very nearly had a different actor playing Logan/Wolverine when the original X-Men movie was released back in 2000. Though several A-List stars were sought for the role, their fees provided intimidating and newcomer Dougray Scott was cast as the mutant hero with the Adamantium claws. When Scott’s work on Mission: Impossible 2 ran long he was swapped out for total unknown Hugh Jackman and the rest, as they say, is cinematic history. Thirteen years later Jackman (Les Misérables) has suited up again, marking his sixth appearance as the man with the questionable sideburns and some serious anger issues. Though he stumbled with 2009’s misguided X-Men Origins: Wolverine, Jackman isn’t one to throw in the towel easily so it was back to the drawing board. After several stops and starts his mea culpa is here, simply called The Wolverine and it’s a much more enjoyable outing, taking the character into some needed dark territory which gives Jackman a chance to infuse a fair amount of gravitas to a character born from a comic book. Still…a little bit of brooding goes a long way and ever since Christopher Nolan re-invigorated the Batman franchise by giving The Dark Knight a dark arc it seems like every superhero action film since feels the need to follow suit. That resulted in a troubling Man of Steel but The Wolverine just makes it out from the heavy pathos unscathed…though often times the Man with the Iron Claws gets dangerously close to being dragged down alongside the Man of Steel. What helps the movie immensely is the nice amount of distance from everything else in the world of X-Men. Though I love a good mash-up of characters as much as the next geeky fanboy, Jackman’s haunted character needed some room to stretch his claws. Taking place largely in Japan, the script from Mark Bomback and Scott Frank feels more like a moody crime drama than it does a large-scale action film – don’t be scared by that statement because trust me, the film works more often than not. That’s mostly thanks to Jackman who also seems more invested in the film this time around. Jackman is an engaging presence both on and off screen but in this film he doesn’t shy away from letting his dark side show, especially as Logan continues to be haunted by memories of Jean Grey (Famke Janssen). When he’s located by a mysterious woman (plucky newcomer Rila Fukushima) and brought to Japan, he gets neck deep into trouble over unsettled scores and family secrets that turn out to involve him more than he thinks. Aside from Jackman, the women in the movie are the most memorable. I was pretty fascinated with Fukushima as well as model-turned actress Tao Okamoto as the daughter of a man from Logan’s past. Though both actresses are very early in their careers, they acquit themselves nicely…even if Okamoto is somewhat clumsily thrown into a “I saw that one coming” romance with Jackman. As a viper-like villainess, Svetlana Khodchenkova (Tinker Tailor Soldier Spy) looks the part right down to her perfectly placed evil mole but her voice is unfortunately awkwardly dubbed. This makes most of her work fairly distracting and one wonders why director James Mangold couldn’t have figured out a better solution. Perhaps a tad overlong and lacking the larger than life action sequences that the franchise would seem to dictate, The Wolverine begins to run out of steam around the 90 minute mark. With about 40 minutes left, that isn’t great news but thankfully several batteries are recharged near the end and through a not-to-be-missed-if-you-know-what’s-good-for-you credits sequence. If I’m being honest, I didn’t really mind the last stand-alone Wolverine film. Yes, it wasn’t the right movie for anyone involved but it wasn’t a disaster like many that have come before and after it. I know that Jackman wanted to get it right this time and for the most part the film accomplishes what it wanted to. It corrects some past mistakes and sets up future installments for not only more Wolverine films but other X-Men adventures in the years to come (X-Men: Days of Future Past is set for release in May of 2014). Is it the best film that could have been made…no, it’s not. Still, it’s an entertaining entry that rates high on the popcorn scale. Synopsis: A team of explorers discover a clue to the origins of mankind on Earth, leading them on a journey to the darkest corners of the universe. There, they must fight a terrifying battle to save the future of the human race. 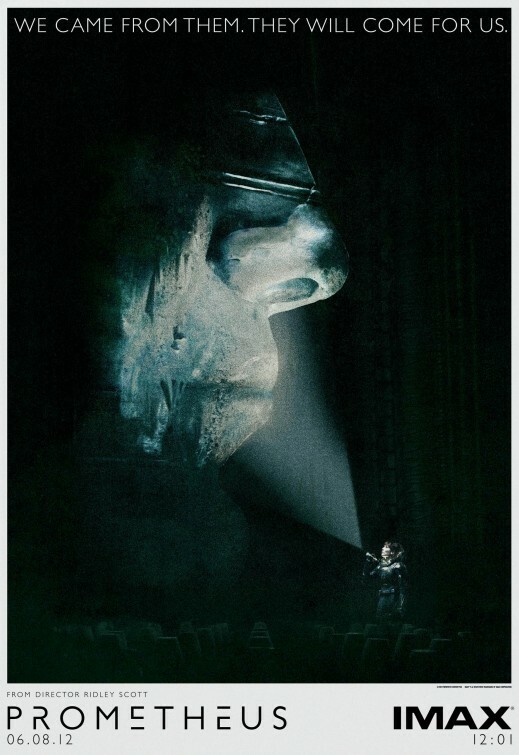 Review: When 20th Century Fox announced Prometheus, buzz concerning its possible ties to their Alien franchise was hot. When Alien director Scott was officially on board at the helm the buzz volume was raised several decibels. In production and marketing of Prometheus prequel rumors ran rampant and the filmmakers didn’t do much to dissuade the public from such thoughts. Deliberately cagey, they kept their cards close and told us only what we needed to know: that this film wouldn’t be a retread of what we’ve seen before and its plot could have ties to the Alien universe. How refreshing, then, to see that the studio stuck to its guns and kept the film tightly sealed until today’s release. More 2001: A Space Odyssey than any of the Alien films, Prometheus is a possible franchise starter that is designed for a moviegoer that would rather not check their brain at the door. Even with its imperfections Scott has delivered a film with the balls to ask big questions, showcase incredible visuals, and provide some chilling sequences. It’s been quite a while since a film budgeted as a summer blockbuster dared to introduce ideas of our origins and our relationship to a higher power. Where do we come from or who were our engineers is a more refined way of asking ‘Which came first, the chicken or the egg?’ and it’s the driving force behind the mission that brings the crew of the Prometheus spacecraft to a distant planet. Funded by a shadowy corporation (that absolutely has a relation to Alien), the 17 member group is stocked with the usual suspects: geologists, medical experts, historians, grunts, an icy executive (Theron), and one very complicated android (Fassbender). A brief prologue makes more sense as the movie progresses and sufficient earth-bound exposition is shown before our outer space journey begins. An expertly designed tour of the ship introduces us to not only the many nooks and crannies but also to David, an android that fancies himself a not quite flesh and blood Peter O’Toole. Once the crew is awakened from their two year space sleep and the objectives relayed to all aboard the deeper questions and adventure of Prometheus emerge. To give away much more of the plot would be a disservice to the careful structure that Scott and screenwriters Jon Spaihts and Damon Lindelof have put into place. Let’s just say that further exploration of the planet creates trouble as is nearly always the case when man ventures where he should not go. Which crew members learn that lesson the hard way is something you’ll need to discover for yourself. Now well into his 70’s, Scott returns to the sci-fi genre that put him on the map and that he shepherded into a new era. The work he did on Alien and Blade Runner have made these films classics and he still has that golden touch. Clearly interested in not going back to the exact same well, he instead found a new reservoir that’s pretty close by but with water that tastes a little different. Part of what has made Scott such an A-list director is his ability to choose the right people for the job. Though all 17 members of the ship aren’t explored in extreme detail, Scott has cast our primary and secondary leads with actors that are incredibly varied and interesting. Though not listed in the primary opening credits, Scottish actress Kate Dickie is a prime example of smart Scott casting. As medical personnel, Dickie has such an interesting look that she becomes one to watch either directly or indirectly in her limited screen time. This also is true for several exploratory crew members that could have easily been treated with no regard but have been given strong life by lesser known/unknown actors. In our leading role, Scott continues his good instincts by utilizing Rapace’s talents in her first lead in a US picture. The original Swedish Girl With the Dragon Tattoo, Rapace made her US debut in a wasted glorified cameo with December’s Sherlock Holmes: A Game of Shadows. While she’s no Ellen Ripley, Thelma, or Louise she still creates an original character that is motivated by more than ambition or greed. She helped to identify the signs that have brought her to this planet in hopes of learning about our creation. She’s joined by a fellow scientist and lover (Marshall-Green) who may not completely share in her endgame outcome. Their romantic subplot is a weaker part of the movie, though it does prove essential to a development late in the film. Theron is at her chilly best as the corporate representative onboard to represent the money side of things. Her relationship with David piques some questionable interest and the secretive silence behind her dagger staredown of nearly everyone sends a message loud and clear that there is more to her than we are seeing. Theron excels at these strong female roles and comes off better here than she does in Snow White and the Hunstman. Elba too brings a perfect attitude to his rumpled pilot role and gives the film a nice and solid core with a watchful, thoughtful, eye. Prometheus is being released in 3D and IMAX and it’s one of the few film that utilize the filming techniques for all they’re worth. The 3D gives depth to both the spaceship and planet as the explorers venture further into the heart of unknown darkness. The visual effects are top notch and pretty incredible in their detail…expect the effects teams to be up for multiple Academy Awards for their beautiful work. There’s been a bit of a backlash as more people are seeing/reviewing Prometheus concerning the fact that it’s not Alien but then the film really never tries to jump that hurdle. If you go into the film wanting that same Alien experience you’ll be disappointed and sadly miss a strong stand-alone picture. It’s relatively short on scares but not lacking in tension or well-crafted “get out of there, don’t touch that” terror. While it may be devoid of any of the now famous one-liners or sequences that made Alien (and for that matter Aliens) classic, I get the feeling that everyone involved wasn’t setting out to duplicate what has been done before. In doing so they have provided an intelligent and grandly sci-fi adventure that brings the viewer to the far reaches of the galaxy to answer our basic questions of life, death, and what waits for us beyond.